A high school teacher saw Luevano’s potential and encouraged him. He applied to the University of Chicago and was offered a full-tuition scholarship. Ambitious investments and committed alumni help students pursue the best education possible. Now he’s among a growing number of first-generation students in the College. UChicago’s Class of 2019 represents a roughly 40 percent increase in the number of students who are the first in their families to pursue higher education—an all-time high. The University is doing more than ever to support those students’ success throughout their time in the College. The change indicates the effectiveness of the No Barriers program, which the University launched in 2014 to enhance access, affordability, and career development for students of all backgrounds. No Barriers has helped first-generation students in many ways, including by eliminating student loan requirements from undergraduate, need-based financial aid packages, and by simplifying the financial aid application process. 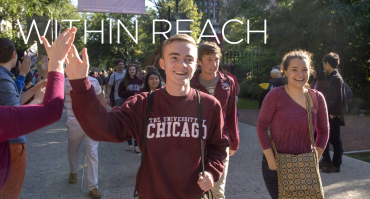 UChicago also is a leader in the Coalition for Access, Affordability and Success, an unprecedented collaboration by more than 80 colleges and universities to improve the college admission process and increase participation by low-income students. "The whole concept of No Barriers is not just getting students in the door. We need to get them to graduation and to their post-graduate plans." Through enhancements to the Odyssey Scholarships, students from families with limited incomes also have access to additional internship or research opportunities and training geared toward career and leadership development. 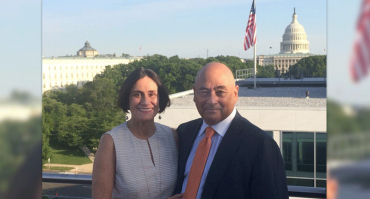 The support of donors has been vital to the success of these programs. Ellison has overseen the creation of the Center for College Student Success, a new office in Harper Memorial Library offering advising in academics, financial literacy, and the College student experience. While the office serves all students, its six full-time advisors and its programming will be tailored to those who are first-generation, low-income, or from other underresourced backgrounds. Navigating tasks such as applying for financial aid, buying books, and choosing classes was harrowing at times for second-year Kyle Wickham, also a first-generation student. “All of it was brand new,” he says. To help them do so, Moore oversees the center’s flagship effort—the Chicago Academic Achievement Program—a seven-week residential summer program, which provides early exposure to scholarly and social life at the University for incoming first-year students, many of whom are from low-income families or are the first in their families to attend college. Students take four University-level, non-credit courses in the humanities, math, science, and writing—a sort of trial run for the Core curriculum. Isa Alvarez says participation in the program this summer helped tremendously in preparing for her first year at UChicago. Her writing skills improved dramatically, says Alvarez, a first-generation student. But the experience also helped her and others build social support to help see them through their first year and beyond. Mentorship and career development are other key aspects of No Barriers’ support for first-generation students. Edgar Gonzalez, AB’14, a first-generation alumnus, is now part of the Education, Equity, and Access Team in the College, specifically charged with recruitment and outreach to underrepresented students. The guidance that Wickham received boosted his confidence and advanced his career goals. He recently completed a Metcalf internship at the University of Chicago Medical Center, which reinforced his desire to pursue a career in medicine. “Now I know what I want to do with my life,” he says. —Originally published on uchicago.edu on October 13, 2015. UChicago’s Class of 2019 represents a roughly 40 percent increase in the number of students who are the first in their families to pursue higher education—an all-time high.